It’s five minutes until 3:00 in the afternoon and already there’s a line of 20 people snaking outside the dark green door. You would think someone was giving away money or tickets to the concert of the year. But it’s just a normal Sunday in Amsterdam outside a bar that’s been here for over 300 years. 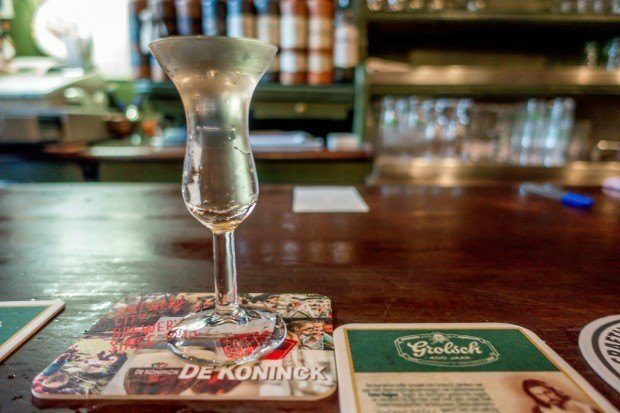 The tiny tasting room behind the door is the peculiarly-named Wynand Fockink, and these devotees are waiting to try the specialty of the house—genever. Genever (also spelled “jenever”) is a clear spirit made from a base of malt wine—a distillate of malted grains like rye, wheat, and corn. It is triple distilled and flavored with juniper and spices. The result is a smooth, malty flavor with a hint of sweetness. Though it’s often referred to as “Dutch gin,” genever is a distinct liquor because gin is distilled from a neutral spirit rather than wine. It’s also sipped neat from a nifty looking tulip-shaped glass. 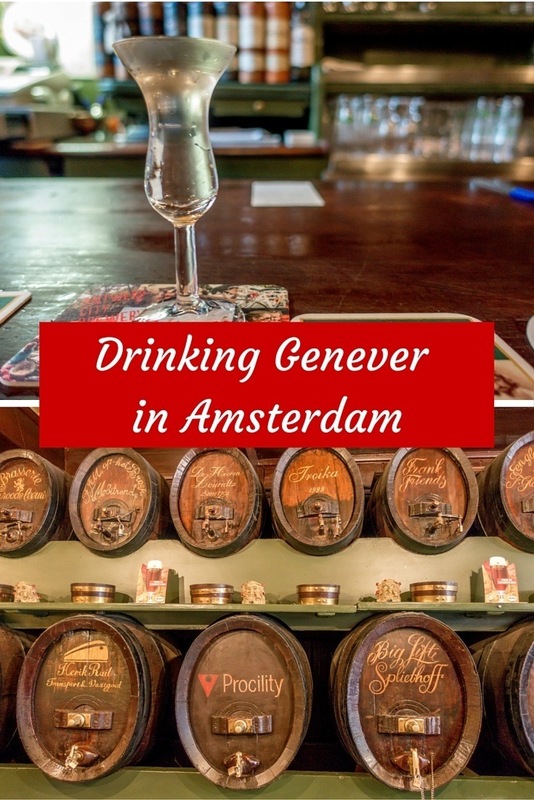 In the Netherlands, genever has been around since the late 16th century, when it was used medicinally. It didn’t take long for the drink’s non-medicinal use to gain popularity, though, and it spread all over U.S. and Europe before being overtaken by English-style gin. It was during this time (1724, to be exact) that Wynand Fockink took over a 45-year-old distillery in Amsterdam, applying his special touch to the products that are still available for today’s expectant guests. 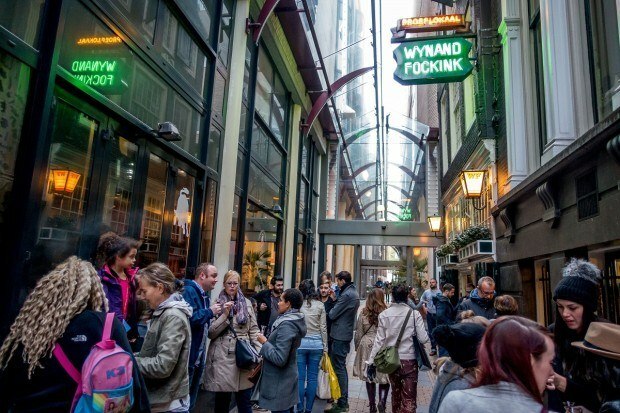 All the people standing patiently outside Wynand Fockink—the tasting room, or proeflokaal, is named after its former owner—are waiting to try some of the 60 or so products now made here. There are three traditional kinds of genevers—oude (old), jonge (young), and superior. Oude genever has a greater percentage of malt beverage, so it has an earthier flavor, while jonge is based on a 20th century recipe that has less malt and more spices. Superior, also known as Corenwyn, is aged in American oak for three years and packs quite a (refined) punch. 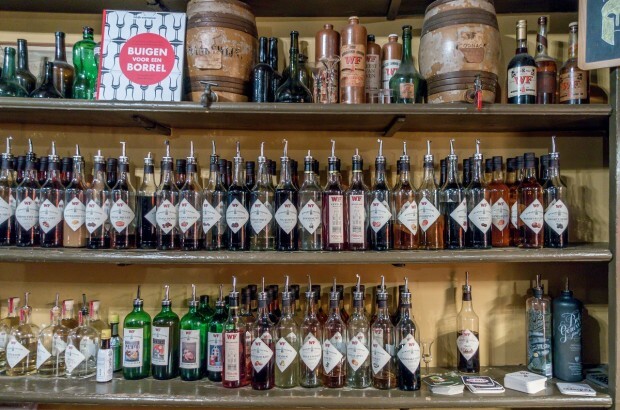 There is also a seemingly endless array of liqueurs that ranges from straightforward flavors like apricot and blackberry to those that are a little harder to explain with names like Hansel in the Cellar and My Aunt’s Perfume. When the doors open, visitors flood into the small space, thoroughly examining the multi-colored wall of options. If they don’t go for genever or poor Hansel, the citrus and spice Naked Belly Button or the fruity Don’t Forget Me liqueur might be options. 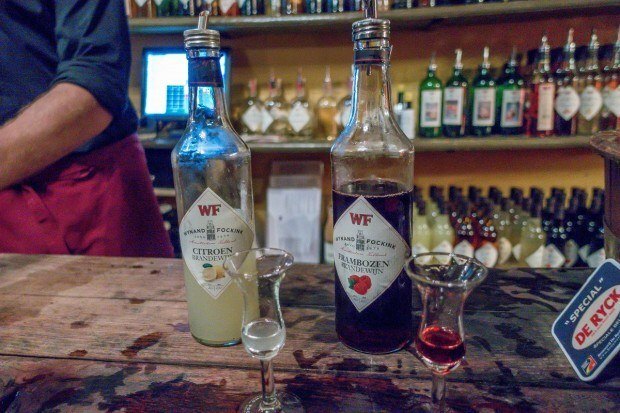 No matter what items they choose to try at a tasting room like Wynand Fockink, the sipping is always done in the same way. The bartender fills the glass all the way to the brim. With hands behind their backs, visitors bend down to the bar to take the first sip. Only then can they actually pick up the glasses and sip away on their drink of choice. I wish I could tell you why it happens this way, but some things are just tradition. With drink finally in-hand, you can stake out a square in the standing-room-only tasting room. But if it’s nice out, do like the locals do and mill around outside. If you’re lucky, you might be able to perch on a window ledge until it’s time to go back inside and begin the ritual again. De Drie Fleschjes – Across Dam Square from Wynand Fockink, De Drie Fleschjes (The Three Bottles) is another of Amsterdam’s original genever tasting rooms. The bar dates from 1650 and feels similar to Wynand Fockink but with more space, a slightly smaller drink selection, and food. There are also a few places to sit both inside and outside, but don’t expect luxury here—the floor is covered with sawdust, just as it has been for centuries. 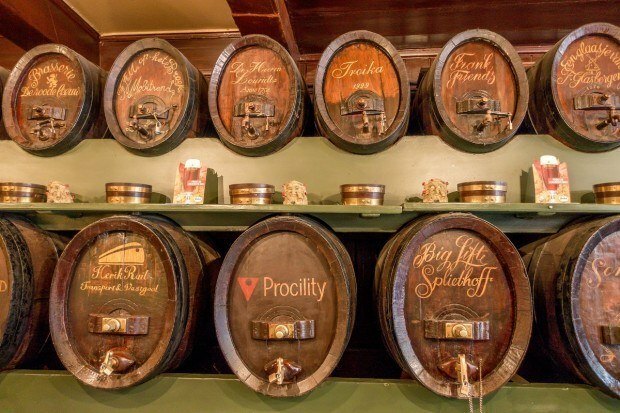 One of the coolest features of De Drie Fleschjes is their wall of barrels. Nearby businesses buy genever in bulk and keep it here on prominent display in the locked barrels, to which only they have a key. It’s the old-fashioned way of having a tab at your regular bar. As at Wynand Fockink, the bartenders here know their drinks and will take the time to educate anyone looking for recommendations. Although you’ll encounter a few tourists, most of the patrons will be Dutch. 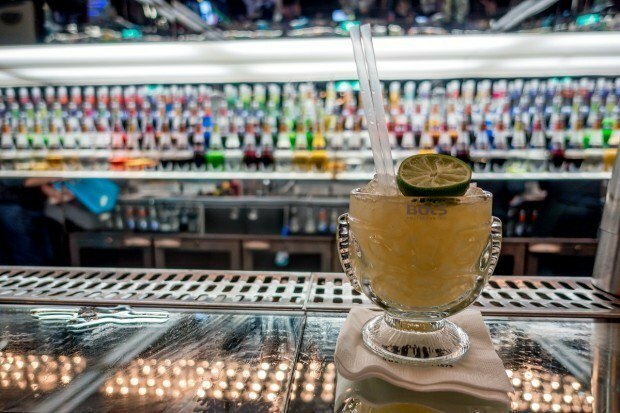 House of Bols – On the opposite end of the drinking spectrum is the House of Bols, a museum and bar dedicated to telling the story of genever, liquers, and its founder, Lucas Bols. Visitors to the flashy, multi-media-filled space learn about the founding of the Bols company in 1575, its foray into genever beginning in 1664, and its expansion into a global brand throughout the 19th and 20th centuries continuing through today. 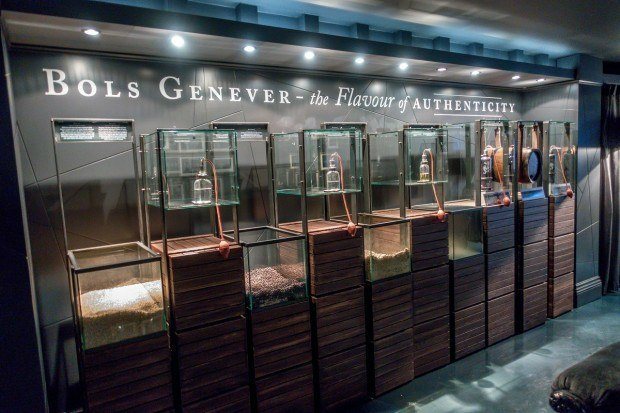 Displays highlight the ingredients in genever, allowing visitors to smell the different notes that the components impart into the drink. There is also an opportunity to smell the different scents that go into Bols’ massive line of liqueurs. All this prepares you for the piece de resistance—the bar, where you can choose all manner of genevers, liqueurs, and specialty cocktails crafted just for you. To learn more about things to do in Amsterdam and suggestions for what to eat, visit our other articles on the Netherlands. I was the guest of Iamsterdam at Wynand Fockink and used my Iamsterdam card to receive a discount at the House of Bols. All opinions of the smooth and fruity are my own.